What would happen when our food reviewer Rebecca Anne Milford returned to the scene of one of her favourite meals of last year? Would the new menu live up to the hype? The Lowdown: It might not come as a surprise that, as a food reviewer, I often get asked where my favourite places to dine are. But, instead of calmly reeling off the creme de la creme, it’s instead usually met with a surge of panic as my mind goes blank, and the only places I can think of are those where I’ve been sensationally underwhelmed, or had one too many cocktails and stumbled blearily out into the night. However, one place I did continuously extol the virtues of last year was The Truscott Arms – and I wan’t alone. This Maida Vale pub, with a dining room upstairs, is lucky enough to have Aidan McGee at the helm – a young chef with big ideas for a seasonal menu. Since my last visit in autumn TTA has been attracting attention for all the right reasons. Only recently it was awarded Best Gastropub at the SRA (Sustainable Restaurant Association), and they were the best newcomer in the top 10 Gastropubs in the Budweiser Budvar Top 50 Gastropubs in the UK. So when I heard Aidan had created a new spring tasting menu then I couldn’t book in fast enough. Location: Maida Vale, off the beaten track and on a rather assuming road with a handful of local shops, little restaurants and pretty residential buildings. It looks like charming local boozer from outside, and always seems to have a cluster of cheerful locals propping up the bar. The Occasion: Come when you want to be excited by food again, and to experience the best of British produce. The Truscott Arms will give you a real enthusiasm for taste and flavour combinations – budding chefs or wannabe gastronomes will be in their element. Decor and Atmosphere: This is casual-stylish, with bright splashes of modern paintings and comfortable leather chairs designed for winding-down. High ceilings, jolly tartan upholstery, dark wood, and an open kitchen that treads a perfect line between relaxed and refined. A happy hum of diners and a sense of camaraderie prevail, and one can feel that the waiting staff and the kitchen know exactly what they’re doing. Aidan had created a fabulous Tasting Menu to welcome us back, and we we had the same thrilled anticipation as when one is about to start a novel they know is going to blow them away. The amuse bouche of fish roe positively burst in the mouth with the delicate biscuit base crumbling like the damp sides of a sandcastle, and warm bread had to be pushed away so we didn’t scoff it all. 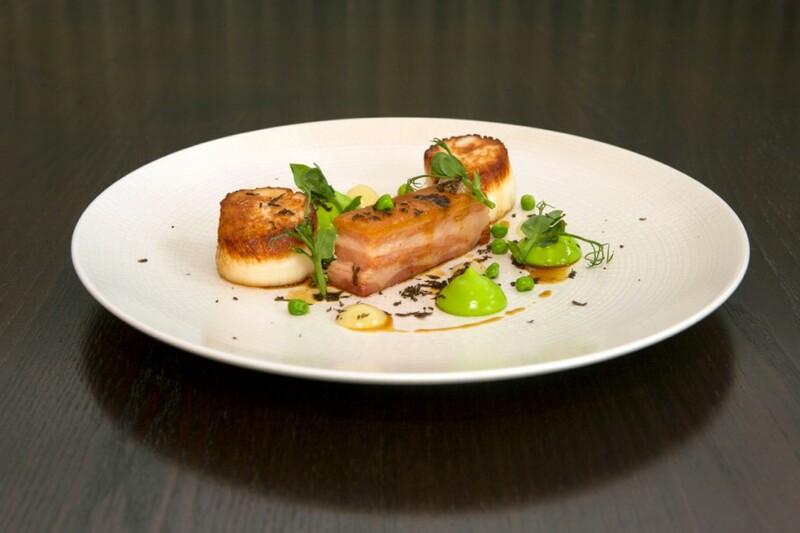 We started with Scottish Scallops – robust coins of sweet, pillowy seafood that couldn’t have tasted fresher – they were delightfully sweet, and cut through with the zing of lemon curd while simultaneously complemented with a rich saltiness from smoked bacon. A green smudge of pea purée, vivid as May fields, was silky and lifted the whole dish, while the marbled shavings of truffle added decadence and the loamy, heady sensation of walking in fertile woodland after spring rain. A further reminder of the season came courtesy of pretty pea shoots. Next was Veal Sweetbreads – and for anyone who takes against this creation, think again. A parcel of perfectly tuned meat, enjoyed with the sweetness of lavender honey and the crunch of hazelnut, could not have transported us to the British countryside more. Sensational. 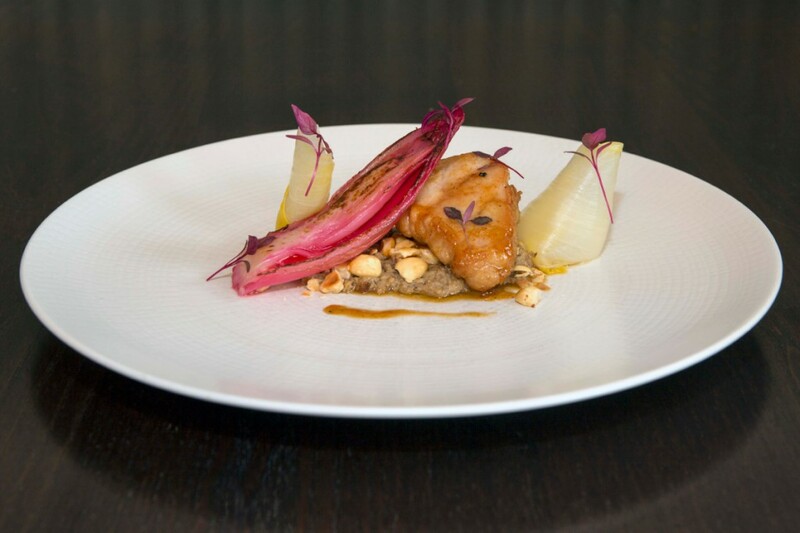 Rabbit made an appearance on our plate – a dish with all the colour and vibrancy of a spring border. Served in a variety of ways, from a rustic, crumbed option to a truly intense mousse that was dabbed at little by little – it was accompanied by a ribbon of pickled carrot for balance. Absolutely stunning, glowing in the mouth like the first rays of sun after an April shower. The meat course next – a hunk of pink, robust Ballindalloch Beef that rested on the plate in plump triumph, surrounded by a syrupy sticky sauce that clung to the cow and made our mouths water with just the smell alone. Fried onions were another jaunty addition, bringing waves of nostalgia for June funfairs, and turnips and mushrooms added their earthy tones. The dish was rustic, hearty, British fare. Our next course was a symphony in pink – rhubarb, in both gel and sorbet form. I love the tartness of this food, and the black pepper crumble added superb texture. Washed down with some pink fizz, it was a clean and lip-puckering interlude. And then, to finish, was a lesson in chocolate-heaven. A slick of heady indulgence, given a pep with mint ice cream and little green cubes of jelly. We were officially, undoubtably, satisfied. Best of the booze: We began with cocktails – The Truscott Arms have an exciting list of things they’ve created themselves, again using fresh produce – the Simon and Garfunkel, for example, contains parsley, sage, rosemary and thyme, combined with Appleton’s Rum. A Bandito – mezcal, martini and rhubarb bitters – had a delicious, lip-smacking herbal dryness that made it the perfect beginning to a meal. 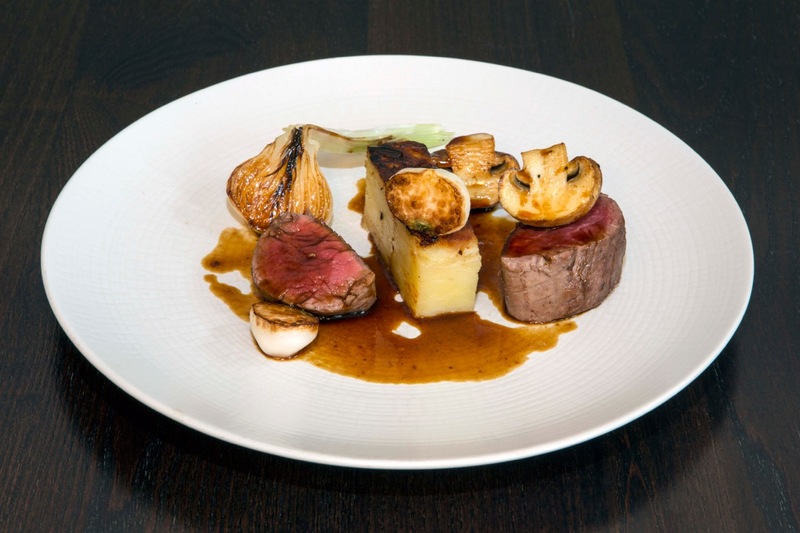 We heartily recommend the wine matches with the tasting menu to emphasise the best of the flavours. Overall: Naturally, there was part of me that was concerned it wouldn’t live up to last time – but of course, I needn’t have worried. Aidan McGee has done it again. The new menu is inventive while still remaining true to the key flavours, and is a lesson in exciting cooking – the way it’s presented, the unusual combinations, and the sense of frivolity about the dishes. The food simply blooms on the plate, with all the promise of spring-time. Will I continue to recommend The Truscott Arms as one of my favourite places to dine? You bet I will.